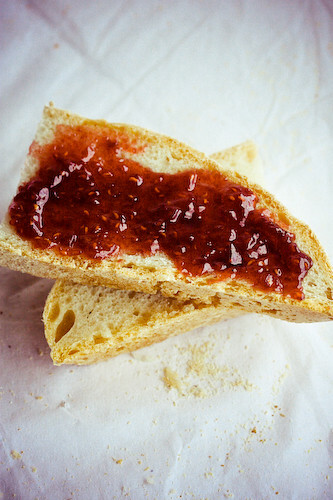 "Good bread is the most fundamentally satisfying of all foods; and good bread with fresh butter, the greatest of feasts." So says James Beard, that uniquely American food writer, in the introduction to his book dedicated to the most basic of food groups. (Bread is its own food group, right? I mean, seriously. Staff of life and all that.) Even in the 1950s he was lamenting the "spongy, plasticized, tasteless breads, presliced, doctored with nutrients and preservatives" that lined grocery store shelves. I make it a practice not to knock prepared bread, since I realize not everyone has the time or urge to make a sponge, leave it overnight, add in more flour, kneed it, leave it to rise, punch it down, leave it to rise, punch it down and form it, and leave it to rise yet again. So if you're not into bread because you just don't want to, no judgments here. However, if you're not into bread because you're afraid, we need to have a talk. Bread? Not that hard. Seriously, and I would admit it to you if it were. I'd say, 'see this loaf? It was so very, very difficult, but I did it anyway. I hope you're impressed.' But I won't, because it wasn't. 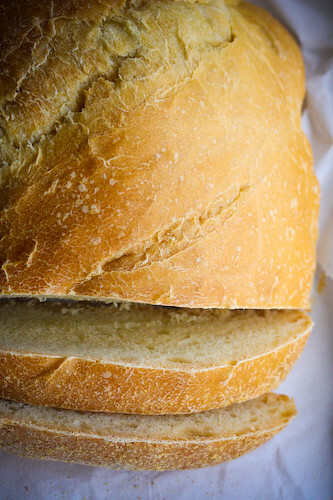 Bread, like everything else, is just about following steps and saving the task for a day during which you'll be able to occasionally check in and give it a good smack down. I've failed at a lot of thing in the kitchen. Things that are supposed to be easy and basic. For example, I have yet to cook rice that doesn't slightly burn at the bottom. But I haven't yet failed with bread. Maybe because bread is so good that it's good almost no matter what. But anyway, this is an easy loaf, and it doesn't require any machines. It doesn't even require a tin, since it's free-form and you just kind of mound it on a baking sheet. James Beard does suggest lining your oven with tiles, by which he means unglazed quarry tiles, which act as baking stones. I have yet to find them in NYC, but they're supposed to be inexpensive and magical. I did, however, have a pan I could fill with boiling water and place in the bottom of the oven to help with that great crust. So here it is, a basic loaf from a quintessential food lover. By the way, I'm sending this over to Wild Yeast for Yeastspotting because, yumm, Yeastspotting. Check it out! Put the warm water into a large mixing bowl and dissolve the yeast in it. Let the yeast proof, which means it should kind of bubble, for a few minutes. Next start adding the flour along with enough water so that it's quite a soft dough. Mix the sponge well so that everything is Incorporated, then cover it with cling-wrap and refrigerate it for one to two nights. Remove the sponge from the refrigerator, punch it down (it will be sticky, don't worry about it) and place it back in its large mixing bowl. Combine the 2 cups of flour and the salt and set aside for a moment. Add the oil, and then gradually add the buttermilk and the flour mixture as you mix. You'll end up with a soft, sticky dough. Flour a clean surface and turn the dough out onto it. This is where that extra 1/2 cup flour comes in. Knead the dough for about 1o minutes, adding more flour as you do so that it get less sticky as you go. Do this until the dough is smooth, elastic and bounces back when pushed on. Oil a large bowl and put the dough inside. Turn the dough around in the bowl so that it becomes coated with the oil. Let the dough rise until doubled, about 1.5-2 hours, maybe more. Put the dough back on a floured surface, and knead again for another 2-3 minutes, adding more flour if needed. Place it back in the bowl and allow to rise a second time, about 1 to 1 1/4 hours, until doubled again. Punch the dough down one more time, and let it rest for 2-3 minutes while you get the baking sheet ready. Just spread some of the cornmeal on the ungreased baking sheet, actually. Shape the loaf into an oval and put it on the sheet. Let it rise in a warm place one more time for 1-2 hours. It might spread a little, but that's why we call it free-form. When ready to bake, preheat the oven to 425F and get a pan of water boiling. Brush the loaf gently with cold water and make a few 1/2" deep slashed in the top without deflating it. Let it rest for one final 5 minute period. Place the boiling water on the bottom rack of the oven, and the bread on its baking sheet on the upper rack. Right away, lower the oven temperature to 375F and bake for 20 minutes. Brush the loaf again with cold water and continue baking for 40-50 more minutes. The bread should be browned and hollow sounding when tapped. Cool completely before slicing and serving. I'm looking for a lebanese and syrian cooking book. Do you have any suggestions for books that comprehensively cover the subject, with colour photos of the recipes? Mmmm, bread! 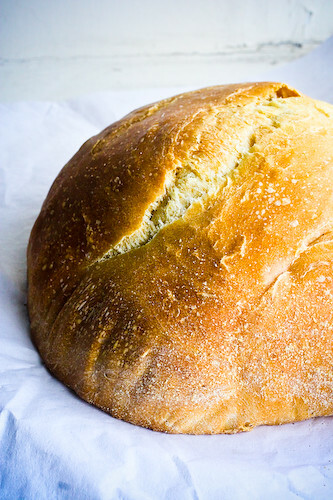 Homemade bread has to be one of the most satisfying things to make, I never get tired of it. I've been meaning to try a simple bread - almost like Bittman's No Knead variety, but I may take a stab at this one first! How do you think this would turn out using a baking stone instead of a baking sheet? Would you recommend using the water as well in that case? Anonymous, I actually don't have experience with baking stones since I don't own one (yet), but Beard usually says to use one and you can use the water trick as well I would think. But then, I really love crust.